This just-add-sand circuit builds strength, power, and stability. Next time you head to the shore, consider fitting in a workout. “The instability of sand requires more core activation and creates resistance as you pull, push, and jump, so your body gets fit fast,” says Stephanie Vitorino, Beverly Hills-based regional director of group fitness for Equinox. “Since sand is so forgiving on the joints, it really allows you to take your training to a higher intensity.” The surface makes your muscles and lungs work harder than they would on solid ground. Do this workout as a circuit, completing all five exercises back to back with little to no rest in between. Rest for 2 minutes, then repeat for a total of 2 to 3 rounds. Stand tall with your feet hip-width apart and hop laterally to the left. Land on the left leg, decelerate into a lunging position and then spring out of the position laterally in the opposite direction. Land on the right leg in the same manner. 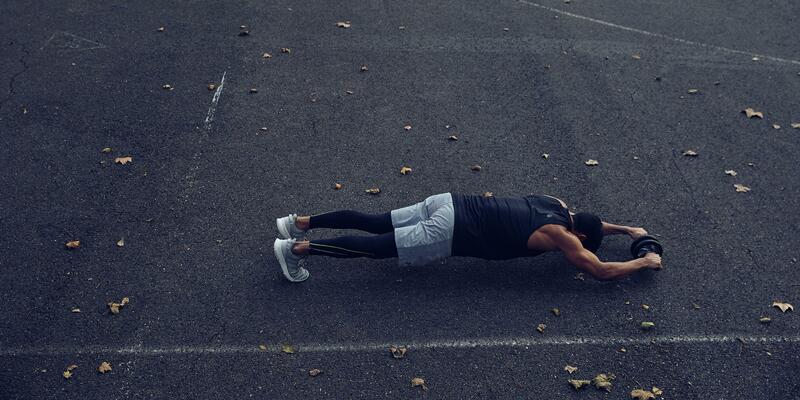 That’s one rep. Do 6 to 8 reps.
With the widest possible arm stance, start in the lowered phase of a push-up. As you straighten your elbows to press your body up, explosively bring hands together, pushing the sand between them to form a pile directly beneath your chest. Immediately return hands to start, pushing sand outward as you lower your chest toward the sand. Do 8 to 10 reps. Stand tall with your feet greater than shoulder-width apart. Lower into a squat while swinging your arms back behind you. Immediately reverse the motion to spring up and forward as far as possible. Land back into a squat and repeat. Do 10 to 12 consecutive jumps. Sit on the sand with legs together and extended out in front of you, heels digging into the sand. Place palms on the sand, your wrists directly underneath shoulders and fingers pointed toward your body. With your elbows close to your body, press your body two inches above the sand, squeezing shoulder blades together and keeping hips under shoulders as you so do. From this position, bend your knees to draw them up to your right side, your heels dragging through the sand. Extend knees back to start. That’s one rep. Do 12 to 15 reps on one side, then repeat on the other side. Using contralateral arm and leg drive, bound diagonally forward with your right foot as far to the right as possible, then immediately bound to the left with your left foot. That’s one rep. Do 6 to 8 bounds, then backpedal through the sand to return to start.